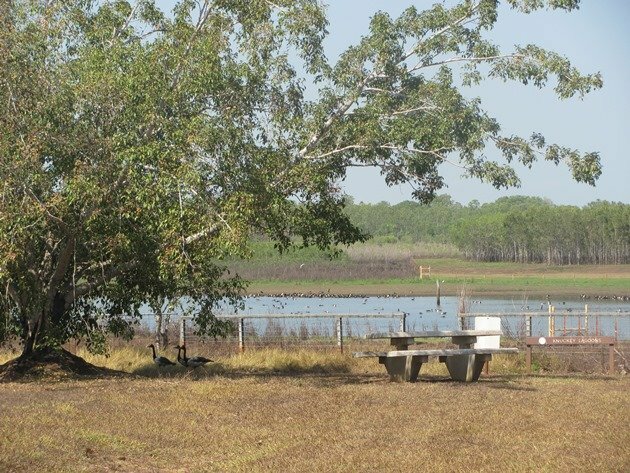 Knuckey Lagoons Conservation Reserve is between two cities! Palmerston lies to the south east and Darwin to the north west and there is a bicycle path almost right to the reserve. It is only about a half an hour bicycle ride to the lagoons from Palmerston and I have been visiting regularly over the past week because it is no longer one big flooded lagoon. The bicycle path takes you through the bush offering a variety of bird-life along the route and then I cross over at McMillans Road and enter the lagoon system at Fiddlers Lane. The reserve is now reduced from one large flooded lagoon to four smaller lagoons and you can almost watch them dry out on a daily basis. My favourite lagoon is the one accessed from Fiddlers Lane due to the diversity and the fact that I can cycle right to the car-park and either sit in the shade at the picnic table or go close to the water’s edge and observe the bird-life from there. The picnic table is under a tree full of fruit that is attracting Figbirds. There are usually Red-tailed Black Cockatoos in the tall tree opposite and Dusky Honeyeaters and Spangled Drongos. 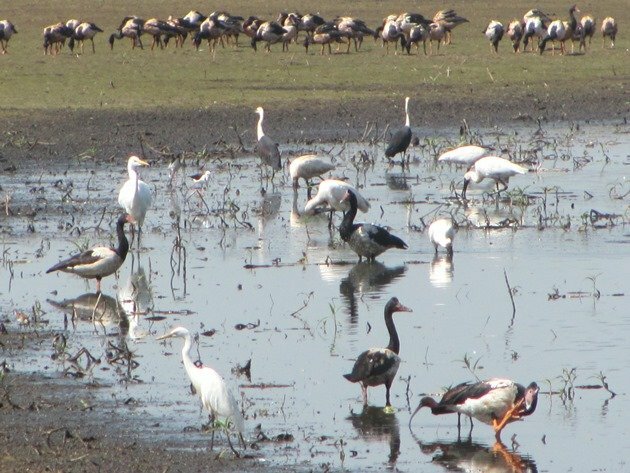 On our previous visits when it was one flooded lagoon system there were numerous birds, but now there are hundreds more birds and the variety has changed. 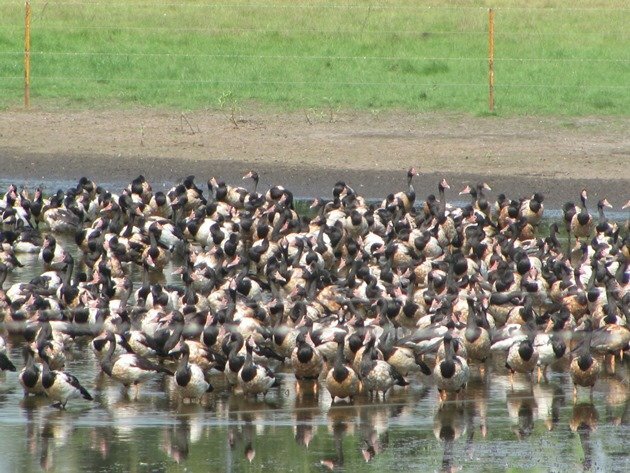 There are no longer any Green Pygmy-geese, but there are over one thousand Magpie Geese. In fact there are so many Magpie Geese it does make it hard to establish what else is present. You first encounter the Magpie Geese with Cattle Egret along Fiddlers Lane in the mango orchards and they are taking advantage of the shade and the fallen mangos. I don’t know if a Magpie Goose that has consumed numerous mangos tastes any different to one that has had a regular diet, but I am sure someone knows! 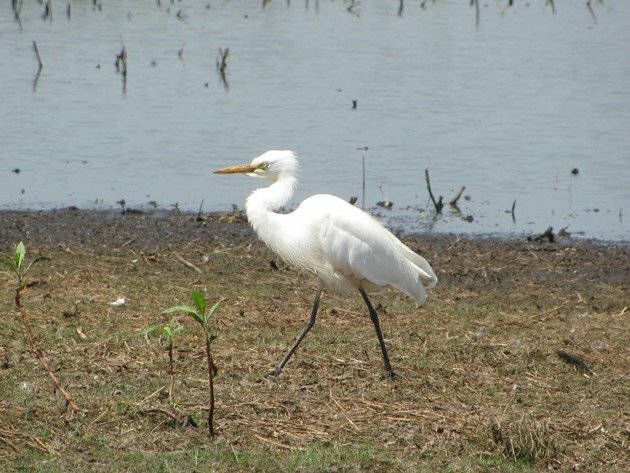 I settle myself in on the grass near the water each visit and then I can look for other bird species and to the left there are usually Royal Spoonbills, White-necked Herons, Intermediate Egrets and Sharp-tailed Sandpipers along the muddy edges. 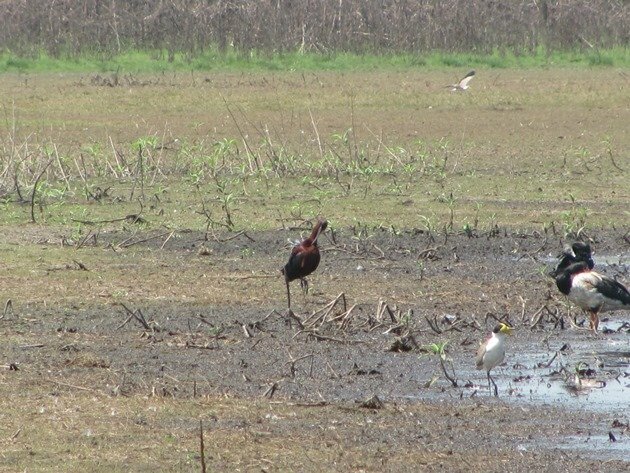 There are always White Ibis, occasionally Straw-necked Ibis and there is always one lone Glossy Ibis. It can mingle among the Magpie Geese and soon become lost in among them, so I always scan through carefully to see if it is still around. I am often surprised by the presence of a Black-necked Stork. It is no surprise that there is one there, but that it can be overlooked among all of the Magpie Geese initially if it is not stood up! By sitting quietly on the grass I often have birds walk by along the muddy edges as they feed. 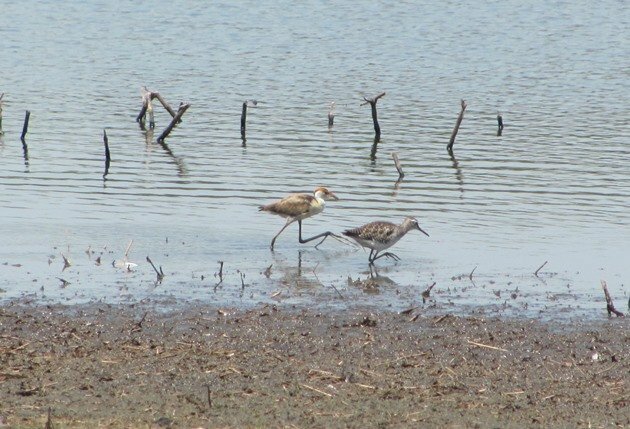 A few Wood Sandpipers have been present this week and also Black-winged Stilt. The Comb-crested Jacanas appear to have bred and the young run along the muddy edges with the other birds. There are small groups of Black-fronted Dotterels and they can easily hide among the Magpie Geese. A pair of Golden-headed Cisticola like to call out and balance on the dry grasses between the car-park and the lagoon. 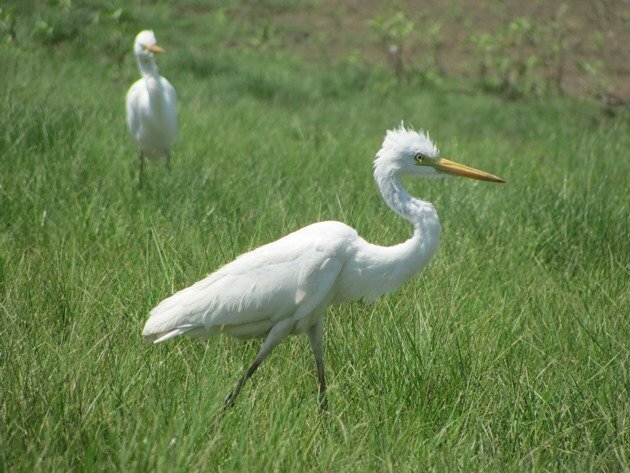 There are Great Egrets, Cattle Egrets and Intermediate Egrets around the lagoon and the Intermediate Egrets came rather close to me as they fed. They did not like other birds encroaching on the area that they were feeding in and would ruffle their feathers up at each other. 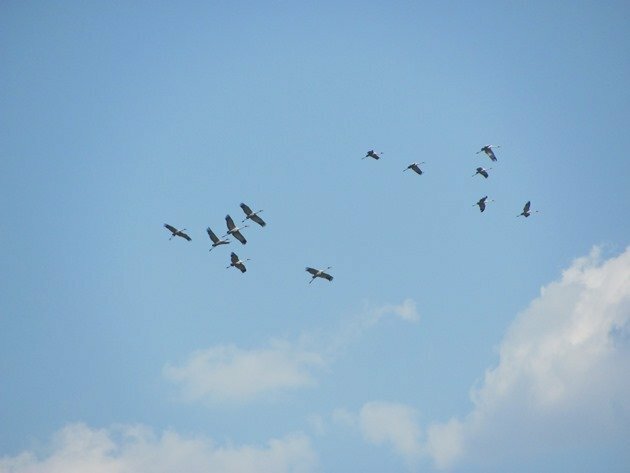 It is important to keep an eye on the sky as well, because other birds fly over and never land in the area. 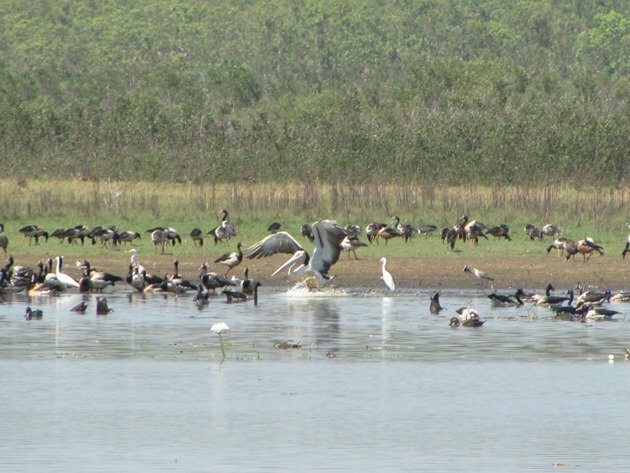 I have had over twenty Brolga consider the lagoon and then fly on further to another lagoon. 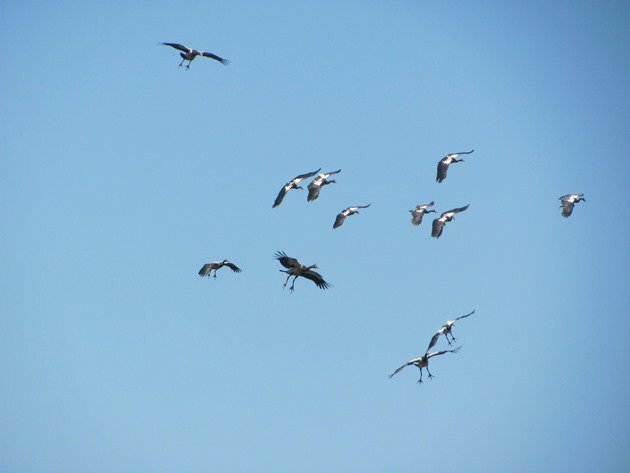 Other birds fly over and decide it is a suitable place to stop, such as several Australian Pelicans. The Dollarbirds and Whiskered Terns swoop low over the water and the Bar-breasted Honeyeaters take advantage of the sticks in the water to dip from. Little Black Cormorants, Pied Cormorants and Australasian Darter are not always present and there is only occasionally an Australian Grebe now the water levels have dropped. 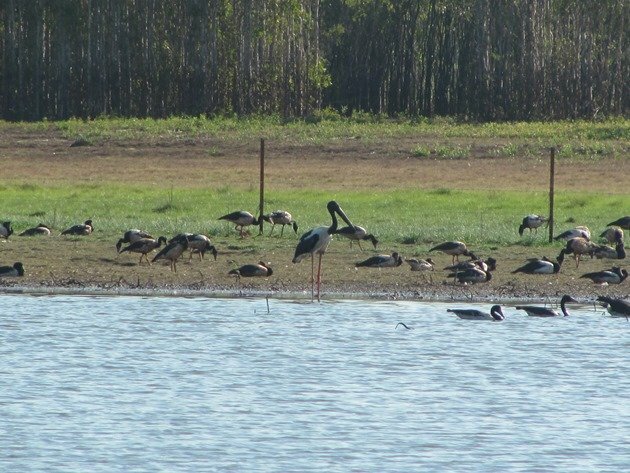 The duck species have been reduced to Pacific Black Ducks and Radjah Shelducks with the occasional Hardhead. On Wednesday this last week I was extremely surprised to arrive at the lagoon and there was not a single Magpie Goose. There had always been several hundred Magpie Geese and although it was very hot and steamy after some rain in the night it did appear odd. Other birds were still present, but the Masked Lapwings were agitated and I suspected there was a threat. It didn’t take long for me to observe a Dingo as it approached the lagoon. 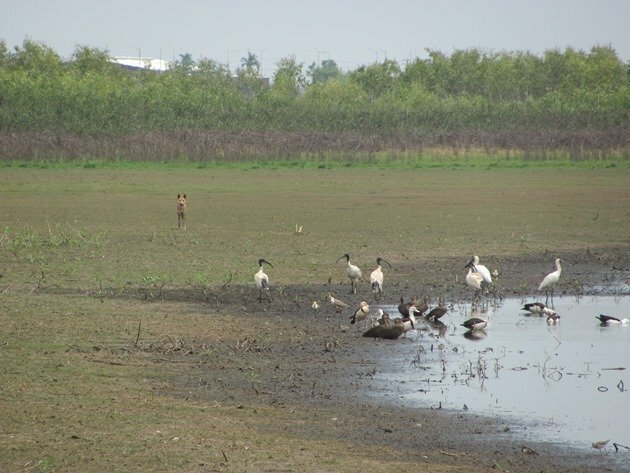 The White Ibis, Royal Spoonbills, Pacific Black Ducks and Radjah Shelducks watched the Dingo, but did not leave and let it walk by. It did not take many minutes from after the Dingo left and the Magpie Geese all returned. They could not have gone too far, but had obviously felt threatened by the presence of the Dingo and left. 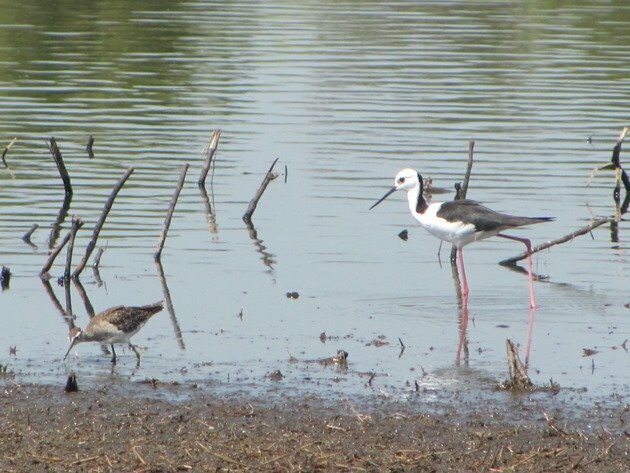 As the lagoons dry out further there will no doubt be more birding surprises and it is a lovely peaceful place to visit at any time of day. We have never encountered anyone else at the lagoons, which is rather surprising due to their proximity to the two cities. It is a birder’s paradise and it appears to be a secret! No complaints from us! 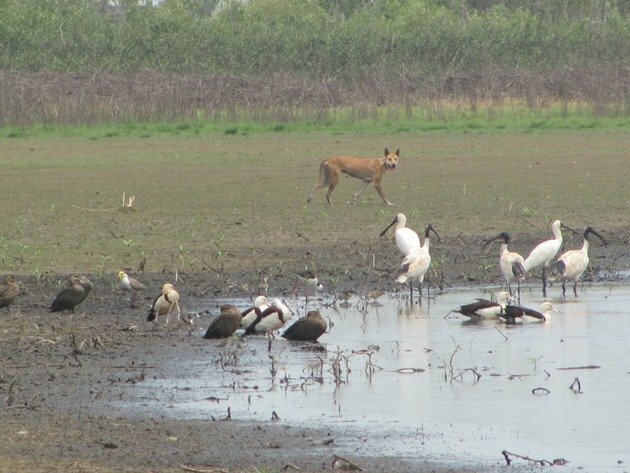 Great photos of the egrets and Dingo! And I think you’ve seen more Magpie Geese in one day than all the birds I’ve seen all year on the Olympic Peninsula!